You are here: Home / Preventive Dentistry / Are You Recommending Xylitol for Caries Control? Are You Recommending Xylitol for Caries Control? There are numerous artificial sweeteners on the market that report to be zero calorie and are added to “sugarless” gums, mints, candies and foods. Xylitol not only fulfills the diet requirement but helps prevent cavities. Xylitol has 9.6 calories per teaspoon compared to 15 for sugar, however it has 0 net carbs as it is a sugar alcohol and does not alter glycemic index. It has been understood for many years that xylitol is beneficial for patients at risk of getting cavities. This fact has made it very popular in the dental hygiene community. It is estimated that 80% of all hygienists discuss xylitol with patients and over 50% use xylitol products themselves on a daily basis. Xylitol is a naturally occurring sugar alcohol that comes from plants and is also naturally present in our bodies. It serves several purposes to prevent cavities. It can not be used by the bacteria in the mouth that cause decay thereby decreasing both the number of bacteria present and the destructive byproducts of sugar metabolism that cause caries.. In addition xylitol creates an alkaline environment in the mouth, which can promote remineralization of tooth enamel. The recommended dose is 5g per day to prevent caries. I have found that the use of xyltiol gum and mints can be both a fabulous replacement product for our patients that already chew gum or use mints or hard candies, as well as being easily adopted as a new behavior to help reduce decay. Xyltiol products are available OTC at regular groceries, drug stores and health food stores. My experience is that when I send a patient out to purchase something it adds complexity that gets in the way so I am a huge fan of having these products available to dispense for patients. 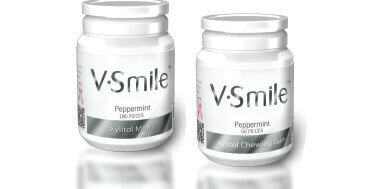 There are several professional brands of xylitol gum and mints available and Heraeus just launched their Vsmile line of oral care products. 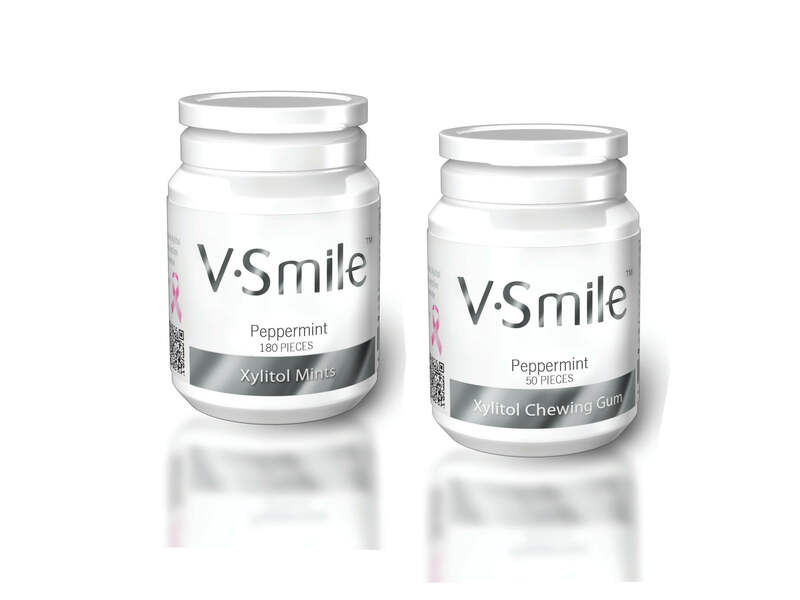 How much Xylitol is in each piece of Vsmile gum? We have been recommending Xylitol and using it for years. It has had great anti-caries and anti-plaque properties for those patients that use it regularly. We use and recommend Spry and Epic brands–Vsmile is a new one to me. Spry has .75 grams of Xylitol/piece of gum or mint. Epic has 1 gram of Xylitol/piece (FYI). I think this is a great tool to help our patients become decay free. They also need to change some of their habits on snack foods as well, but this is a great start. Thanks for posting. There is 1gram of Xylitol is each piece of gum and .5g in each mint.